After what seems like both the blink of an eye and forever, my training for the American River 50 mile race is wrapping up. At the start of 2019, this race wasn’t even remotely on my radar. But a chance outing to a trail running company’s warehouse sale for a cheap running skirt, and a lucky raffle ticket later, my training and my spring racing plans were turned upside down. It feels like hyperbole to say that my chance outing one afternoon changed my life, but I’ve spent more time in the last two months considering what I am capable of than I ever have before, so it just may be true. And I’ve found my friends (both IRL and on social media) have more faith in me and my abilities than I have would have anticipated. I’ll confess, it’s a little heartwarming. Mindset. I can’t quite get my head around the idea that the race is this weekend. The main thing that makes ultra training different from marathon training isn’t more mileage. Most ultra training plans don’t have that much more mileage. The main difference is the back-to-back long runs. These back-to-back runs get your body used to running on tired legs without the addition of crazy mileage which can be hard to fit into life and can increase injury potential. Today was one of the more extreme examples. Yesterday I ran (and paced) the Oakland Marathon. Today, instead of resting, recovering, and basking in my marathon glory, I had another 15 miles on the calendar. As I woke up, physically I felt fine. I was tired and a touch sore, but nothing unreasonable or unexpected (yeah foam rolling!). Mentally, I had ZERO interest in running. I stalled waaaaay more than I should have before I got out the door. I was trying to come up with anything I could do to delay the inevitable. Once I got going, I was fine. The first mile felt a little creaky and awkward as my legs were rebelling, but they got in line soon enough. Rest day. I was gonna do some yoga, but what can I say, I didn’t. I actually felt really good considering. Some extra stretching in the morning, not much else. As i left the house this morning for my run, it was drizzling ever-so-slightly. I debated if i should grab my rain jacket- was i being overdramtic? The drizzle turned downpour 5 miles in. Soooo glad i decided to grab it. As I left the house it started to sprinkle. I felt a little overdramatic, but I grabbed my rain jacket anyway. It was still out from the last time I ran in the ran, so it was convenient. It continued to sprinkle the first 4-5 miles, then about 5 miles in it turned into a deluge. Another run where I was left looking (and feeling) like a drowned rat. I really didn’t want to run this morning, but I feel like I need to keep going with the last push to the end. I did cut my planned 6 miles down to 5 since I knew I was doing a night trail run tonight (night trail runs have been moved to Thursdays for the summer). Tonight’s trail run was just over 7 miles. I felt really great on the only slightly muddy trail. I like this group to run with, but I am (by far) the slowest in the group. Even with a 10ish minute pace (fast for me on the trail, considering the course climbed 700+ feet – and it was my second run of the day), I was alone at the back. I guess someone has to be last. I’m really debating how many miles to run this weekend. At the night run last night, I was talking to two runners who have done multiple 50 mile, 100k, and 100-mile races (including AR50). They said my planned 13/10 distances this weekend were more than I needed to do and I should taper more and relax. Considering my planned mileage was laid out somewhat randomly (as has the rest of my training plan), I just might take their advice and cut the distances back. On a scale of 1 to 10, my interest in doing today's run was a -8. I felt terrible the first few miles (likely due more to my bad attitude than anything physical-let that be a lesson to me) but i got into the rhythm of it eventually. I did fewer miles than I had planned initially but did more elevation gain than I had planned. The first 2-3 miles of this run were probably the worst run I’ve had this whole abbreviated training cycle. It wasn’t happening mentally, it wasn’t happening physically. I got into the rhythm of it eventually. Maybe it was just so odd to have a Saturday long run where I was solo and could run at any pace I wanted. 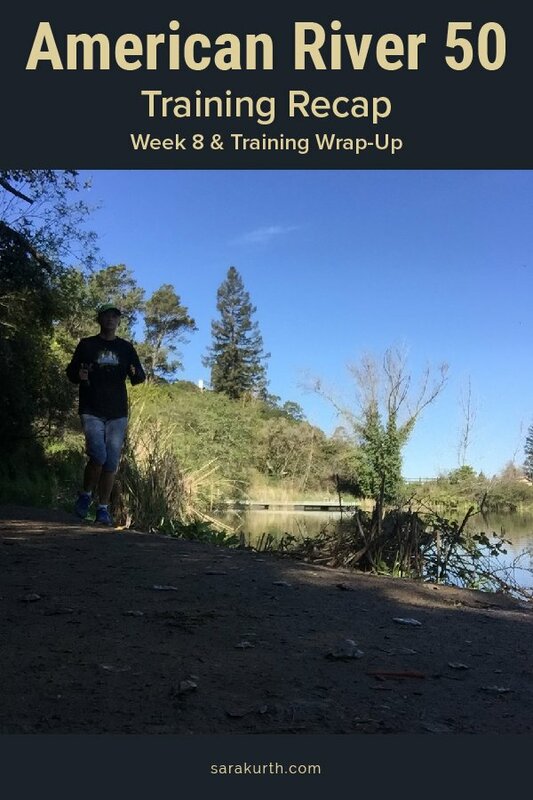 After running 18 weeks with my running club’s training group, it felt wrong to run alone. This morning, I’d been inside getting stuff done pretty much all morning. It got to be around 3 and I realized I’d barely moved all day, so I went out for a 6 mile run. I am an odd duck, I’m either doing 30-mile runs and 50-mile weekends, or I’m doing nothing. Some trail runs, some elevation gain. More stretching than usual, but not yoga. No strength work. LOTS of foam rolling. I’m really heartened that my 15 miles on Monday, the day after a marathon, felt so good. I feel like those back-to-back runs are the most telling of how well prepared I am. I’m officially at the stage of training when I’m totally over it and want the race to be done already. I usually get this feeling after months and months of training. I’ve always figured it was the length of the training cycle that was getting to me, but this time, I’ve only been at it for 2 months. I guess it’s more of a taper thing than a time thing. So now its race week. I don’t know what to expect, I don’t know if I am prepared. I’m not sure what my time should be or will be. I think my training went well. I’m shocked at how good I felt on even the longest long run (28 miles on a Saturday, with a 10-minute pace feeling comfortable!?). It’s maybe for the best that this race was dropped in my lap. If I’d registered of my own devices, I would have over thought it and over planned it. I’m sure there was some benefit for me to have to rely on instinct. I was mostly successful with my training goals. I’ve foam rolled more in the last 2 months than I have in the last year. While I wasn’t great with yoga, I was consistently doing more stretching than usual. Trail runs and elevation gain work? Very OK. I did trail runs when I could, but our rainy spring kept me off the trails more than I would have liked. I was trying to balance running in all conditions so I’m ready for whatever arises on race day and not driving myself insane running on super muddy/ugly trails. Now a week out, I’m starting to get nervous, but its more generalized nerves. To be nervous about something specific would require that I actually understand what I’m in for. I recently mentioned to a friend (a non-runner) I was starting to get nervous. He asked me if I still wanted to do the race given my nerves. The best analogy I could come up with is standing in line at an amusement park for a big, scary roller coaster. You want to do the ride, you are excited about it, but you are scared about it and apprehensive of what you’ll have to get through. There is no doubt that you’ll be glad you did it when it is all done, but the process of getting from here to there is slightly terrifying. American River 50 will also be the first time I’m running with a crew. I have never had personal pacers or crew before. At first, only one friend was going to come out and join me for the last 9 miles (the hardest and hilliest of the course). He then mentioned his girlfriend would love to be involved. So just like that, I have an actual crew. I feel better having them both involved. It makes logistics easier and I’d been nervous about having pacer waiting for me at mile 41 (longer than I’ve ever run before) what if I don’t get there? But now we’ll all meet up at the aid station at mile 29.5 – I know I can get there. I’ve never run with a personal pacer before so I’m not sure what to expect. I think it will be helpful to have someone just ahead of me that I need to keep up with. So often on longer runs, I walk because I feel like I should be tired, not because I actually am. With a pacer to keep me going, I’ll (hopefully) push harder. And I’ll want to finish so I don’t let them down. They are giving up their weekend to help me. I’ll likely be stinky and cranky by the time I meet up with them (so not the best company). I’ll at least want to see the run through to the finish so I’m not responsible for their wasted weekend. BTW- this is the way I’m choosing to look at it. I have no doubt they’ll be proud of me regardless of what happens and they wouldn’t think twice about it if I didn’t/couldn’t finish. But framing this way (not wanting to let them down) gives me a helpful and useful mental kick. What will happen on race day? Only time will tell.